Today’s recipe is a classic in my kitchen. 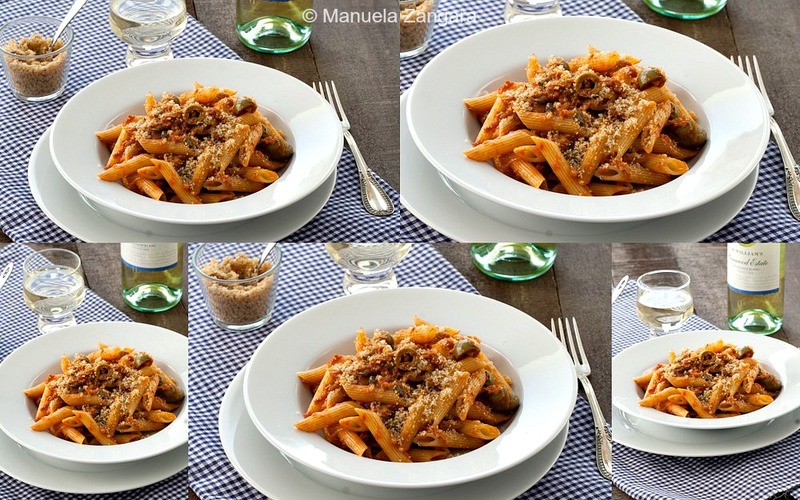 I make it often and it is one of my husband’s favourite pasta dishes. I cannot believe that I have been blogging for over 4 years and I haven’t shared this recipe yet! But I guess it’s like all the things that you are very familiar with: you end up taking them for granted. And that is always a huge mistake. So, here I am to rectify it. 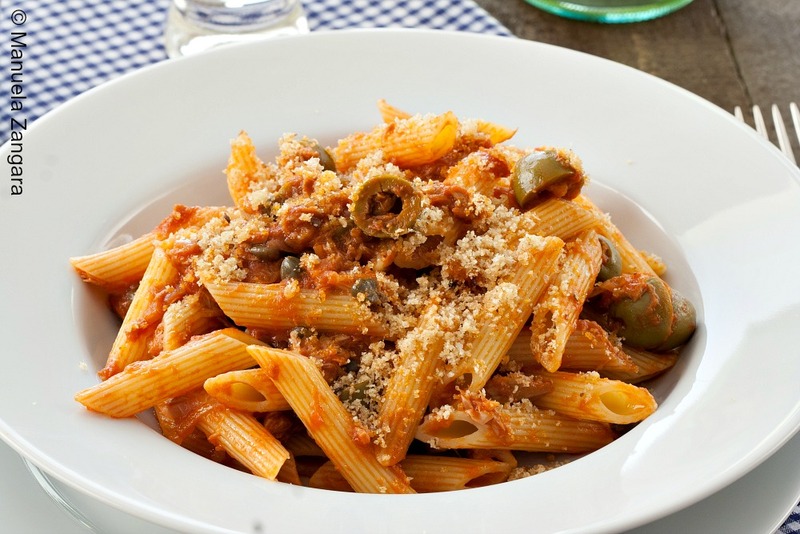 The sauce itself is very easy to make and it has all the classic flavours of Southern Italy: tomatoes, olives, capers and tuna. If you haven’t tried this combination yet, you don’t know what you are missing! 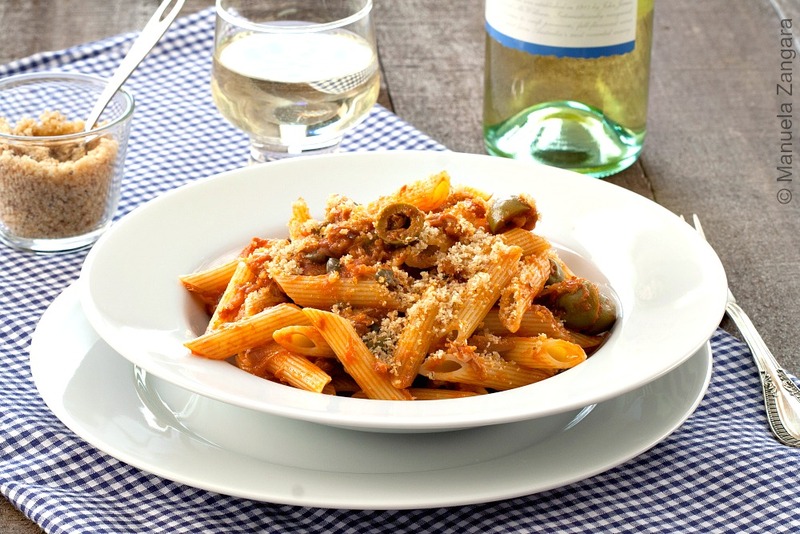 I love to serve this pasta with garlic breadcrumbs, instead of grated cheese. The garlic goes amazingly well with the sauce and it adds a very pleasant crunch to the dish. This Tuna, Olive and Caper Pasta makes for a very tasty, filling and quick mid week’s dinner that the whole family will enjoy! Buon appetito! 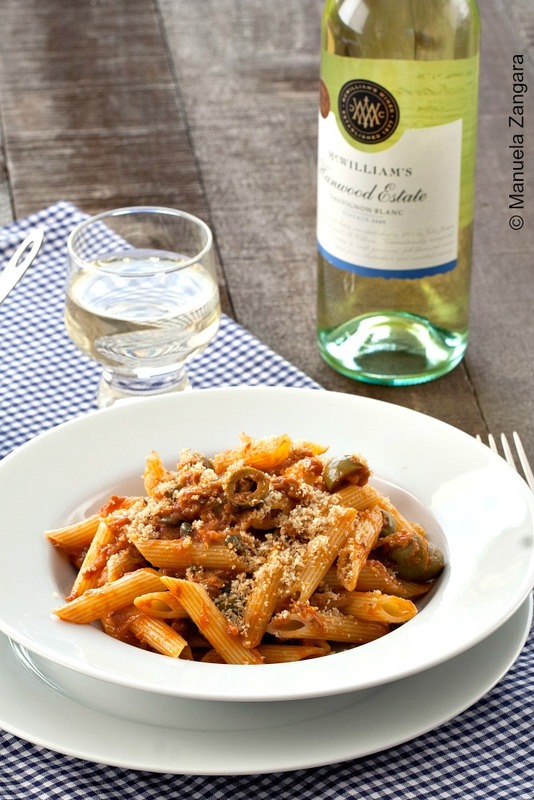 A scrumptious mid-week dinner idea: Tuna, Olive and Caper Pasta with Garlic Breadcrumbs! Crush the garlic cloves in a mortar and pestle. 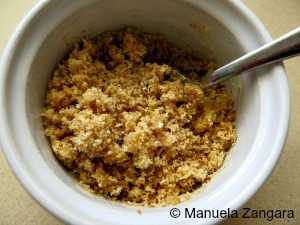 Add the breadcrumbs and extra virgin olive oil. Mix well and keep it aside. Sauté the sliced onions in the extra virgin olive oil until soft and translucent. 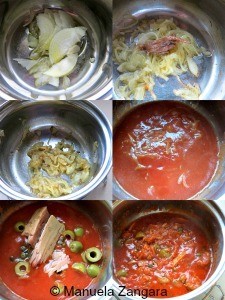 Add the anchovies and let them melt by crushing them with a wooden spoon. Add the tomato purée, mix and cook for 2 minutes. Add the halved olives, capers and tuna and mix. Cook the sauce, covered and on a slow flame, for 10 minutes. Then put the fire off and keep it aside. Cook the pasta following the steps on How to cook pasta “al dente” in the Techniques page of this site. Drain it and mix it with the sauce. Serve immediately with the garlic breadcrumbs on the top. A classic, indeed and looks pretty tasty!! Love this dish. reminds me of my days in Italy coming home from the Liceo. Its a very fast dish to make, 1/2h and it can be plated. thanks for bringing back the memories..